I am a homeworker. Since graduating, this is all I have ever known. I didn’t learn how to do it, I didn’t have to write a report on the value of me working from here over working at the office hot desk… it was the only choice. 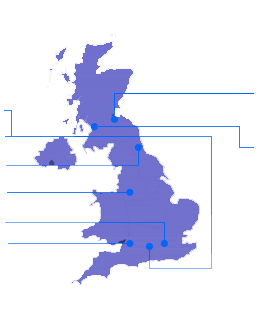 I wanted to live in Bristol, and VideoCentric is based in Reading. Neither of us was going to move, but I was (hopefully) the right person for the job. 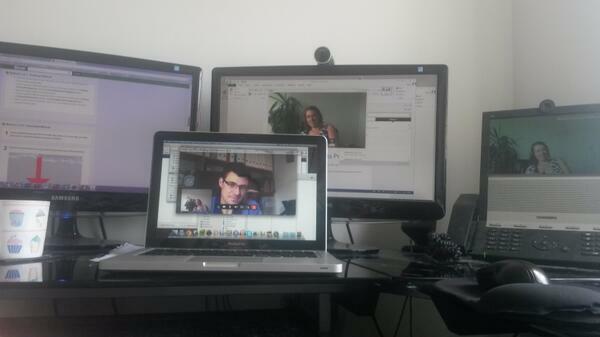 So the birth of VideoCentric’s remote workforce began. To be honest, I began by thinking it was never going to work. I was not going to be able to hack it, or get out of bed, or keep focused on writing a whitepaper when the whole world was at my finger tips – and not a single person looking over my shoulder. Pretty much the dream of any teenager thinking about how they are ever going to prevent getting themselves into what they have been convinced is a downward 9 til 5 spiral, when all they see of their future isn’t any more exciting than sitting in a hot, noisy office, number crunching, with a pile of paperwork in one hand and their forehead planted in the other. So anyway, of course, just like you, I was convinced it wasn’t going to work. Since starting my journey as a homeworker some 4 years ago now, I can’t tell you the amount of times I have heard people say to me “Oh, I definitely couldn’t manage it, you must be so organised, I just don’t have the self control”, or “It must be great, you can just sit in a onesie and watch TV all day!”, which in reality, would probably have been the exact comments I would have given up until the day I became a homeworker myself. To be honest, ask any of my family or my friends about my organisation skills and they’ll be the first to tell you how I was the last person they’d expect to be able to hack “self management”. And no, contrary to what many might think, we don’t sit and laze around in bed all day, nor do we tend to spend the whole day wearing Pyjama’s. Well, I don’t, or can’t, anyway. OK, yes, maybe I do get a longer snooze than my partner each morning, and yes, I do sometimes get to pop on my slippers when my feet get nippy over the winter (waist up visuals must be taken into account). And, of course, if the World Cup finals starts at 5:00pm, then I might even pop into the lounge and give myself an early finish that day. But it’s not all daytime chat shows and baking the afternoon away. It’s serious business. 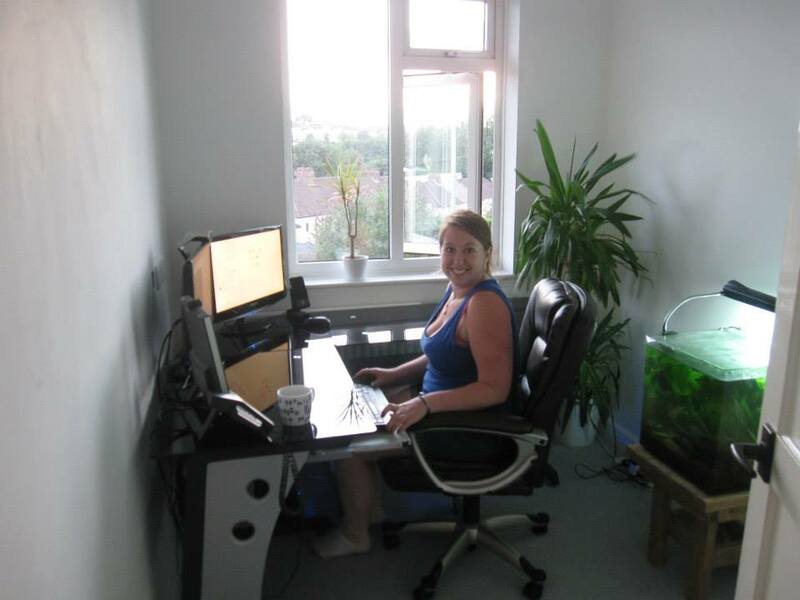 Feeling rather at home in my office – complete with tree, fish tank and video phone. For me, I have set up a permanent office now – the small box room upstairs has provided me a perfect canvas to create what some office workers would dream of – a personal and quiet space without distractions, enough space for dual screens and a video phone, a fish tank, a few plants, and a visiting feline friend that comes in now and again to say hello. It seems, in fact, i’ve gone and got myself what they’d call in the movies, or in our manufacturers solution guides, an “executive office”. Aside from the fact it’s our 3rd bedroom, and i’m not what you’d call an executive just yet, then yes, an executive office it is. I rarely leave this space. I nowadays rarely catch the plethora of lurgies that seem to fester & breed in my partners workplace. And I am rarely reduced to sipping tea I am convinced is just hot water coloured by suspect stains residing in the bottom of an enamel camping mug. OK. Perhaps I do “miss out” on the office banter I hear my friends talk about. But then I wonder how great that banter is when your an hour away from deadline for a £150k tender and gossip about John’s miss’s best friends Friday night antics involving too much tequila down the Fox & Goose is not going to provide that network topology diagram for you any time in the near future. I’ll stick with the Instant Messaging I think. Perhaps, if i’m feeling adventurous (and of course, as long as i’m not in my Pyjama’s), I might even escalate that IM to a video call and catch up with my colleagues face-to-face. This perhaps isn’t really the corridor chat that Marissa Meyer was referring to – however it’s definitely more efficient for me. I must admit, I can see why some homeworkers would say it can be a little isolating, especially if, like me, you are pretty much 100% based from home, with only a visit to the office on the rare occasion that a real hand shake and a muffin can outweigh the 3 1/2 hour round-trip. 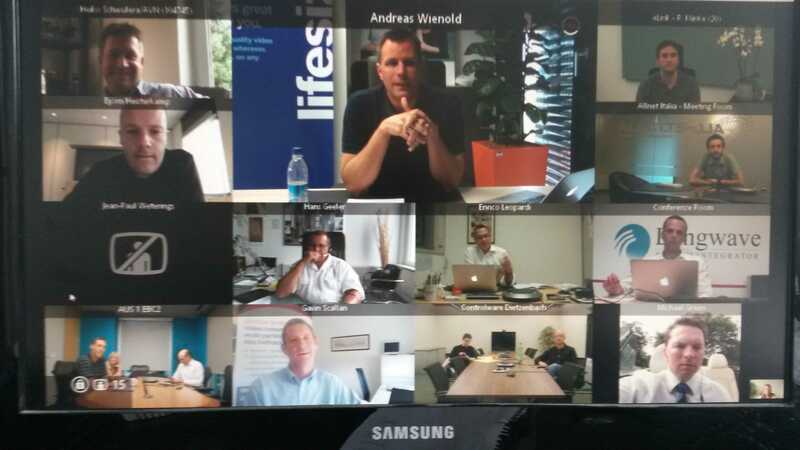 However, i’ve been very lucky to work for an organisation who advocate face-to-face discussions, albeit a virtual one. And to be totally honest, where would my moral compass be pointing if I thought it was at all possible, or right, to promote video communications as an alternative to travel, or to bring teams together, or to enable a home working culture, if I couldn’t hack it myself?! It would be pointing towards “get out of this job and do something you truly believe in”, and that hasn’t happened just yet. So yes, I can see why some would find it isolating. Sitting in a room all day, everyday, without a smiling face or a wave, without a chat over a coffee – that would be pretty dull. But I find myself far from feeling like that – being enabled by the wonderful technologies I so avidly promote, being able to see the person at the other end of the line, well it makes me smile every time I answer the phone. Indeed, our whole team has a video phone on their desks (and a few choices of video conferencing software, but if i’m honest, i’m a fan of my handset, with real buttons, and a screen that doesn’t get in the way of the information I’m discussing at the time). So we are all connected with one another, with a simple 2 digit dial. And the only thing I find I can’t efficiently do now is wedge the phone under one ear, eat an apple, and carry on reading my way through “100 most beautiful places to visit before your 30” without anyone having an inkling that I’m not 100% engaged in an audio conference discussing this years minor budgetary refinements. Yawn. Last week, I managed to break the mould. 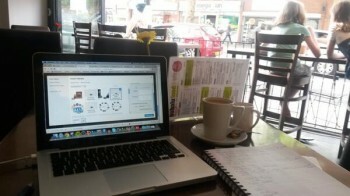 I took myself down to Bubalu Cafe on Gloucester Road and perched myself in a corner with my laptop. Aside from the odd Police car, or the rare sudden 10 second grind of a smoothie, it was perfect. A change of scenery, a fresh coffee, and a super technician who has me simply set up from now on, so that wherever I go, whatever device I am choosing to use, I can be found, dialled, and contacted. No need for my colleagues to know anything different. They dialled my same 2 digit number and got through, without even a glimpse that I might be around the other side of the world. Or in a cafe. (Until I answered, and yes, then the abstract wall art and mood lighting may have led them to suspect something). 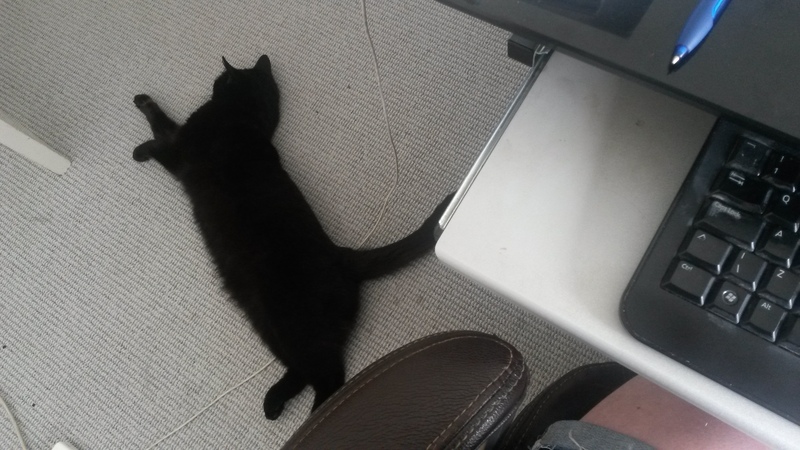 But although yes, the flexibility is there, I must say, I do prefer working from home more than in a cafe (perhaps it was the pair of blabbering mum’s that joined me for half an hour that did it). And now i’ve got my head into the homeworking thing, i’m not sure whether office work could ever be something for me. I mean, I am starting to get used to the fact that my days might stretch a bit longer into the evening because I’m rather comfy working in my slippers, with a cat & tasty teabags. There’s not so much of a need to slip off for a long toilet break at 5pm, stroll out at 5:15, so you can try and silently convince the team that it’s alright for you to “start packing up now, as there’s no point in starting anything new”. And I think i’m past the stage of feeling apart from the team – knowing that the sales team see me more often than they see the team downstairs from them kind of helps you warm to the fact that you can be virtual and still be a solid part of the team. I’m not just saying this because this is our business blog, however i’m not sure if i’d feel completely the same about homeworking without the wonderful communication and video technology that surrounds me everyday. Being able to see who’s at their desk and who’s on the phone without interrupting, being able to feel engaged with all the team (i’ve never got into the “homeworkers often feel forgotten…and are forgotten” stage i’ve very often heard about) and being able to have a face-to-face chit chat with our dispersed team wherever they are at that specific time – well, i’m pretty sure the combination makes me as productive as I possibly can be whilst enjoying being in my place of work, wherever I choose that to be. Using the new Lifesize Cloud from my home office – keeping me connected! So with the new Flexible Work privileges now in place in the UK as of the 30th June, how are you, as a manager, going to be preparing your workforce to be the most productive they can be whilst also working from wherever they choose? As an employee who wants to be flexible, do you think your organisation will manage successfully? Please do comment below – i’d love to hear your thoughts! My thoughts? Be open, be confident, be supportive. Get the right tools in place, trust your staff, recognise the impact greater job satisfaction & employee retention has to your company, and be prepared for change. Traditional working methods are being surpassed by 21st century thinking, by the millennials entering the workplace (or perhaps now we’re starting to have a bit of an impact) and as an employee who has been given the chance to be flexible, I can tell you that I hit my deadlines, I exceed my targets, I feel part of the team & I love my job. Wonderful piece, thanks for the great insight into home working! As a business we are actively encouraging home working for our staff – there are definitely a few at the top who are suspicious, but most of us think its brilliant – and your blog does show some of the reasons why! Animals can be a hoot, can’t they? I miss that the most, although I haven’t had cats for years now. They stop you tainkg yourself too seriously, which is a easy trap to fall into when you spend a lot of time alone. Nice blog! I work from home too and this tells it just as it is! Thanks Amy, I’m very glad that homeworkers are enjoying it too! Excellent article! Loving the ‘executive office’ analogy ! Excellent Emily~you’ve hit the proverbial ‘work from home’ nail right on the head. As a Virtual Assistant being ‘Virtual’ is my business. I’m far more productive than I ever was when a conventional PA. I can be flexible with my 9 to 5 time, yes. But that allows me to be far more focused on my deadlines and on my working day. Contrary to popular belief I’ve never switched on day time TV to watch a bit of This Morning or JK. I have however taken part in a ‘skype’ meeting while wearing PJ bottoms though (once) and it was early in the morning. You’ve told it how it is…..
Love the blog, thanks for sharing. Really shows how flexible working can be achieved with the right attitude and technology. Thanks for the comment Pete! Just a I said above, I’ve heard those comments countless times and is exactly what I thought before I started it! However, it isn’t for everyone – I think once the novelty has worn off, you might realise there is actually a distinct lack of distractions in comparison to an office! Thanks for the pingback David! I hope you enjoyed the story and I hope to find us building up an interesting “VideoCentric” tag on your site over the coming months and years 🙂 (http://letsdovideo.com/tag/videocentric/) Love the new site too – Great work!!! Thanks for this post, I am a big fan of this web site & I would like to proceed to be updated. Hi there Jane & thanks for commenting! I am glad you like the blog piece and agree with this viewpoint. Your site has some very interesting information around remote working! 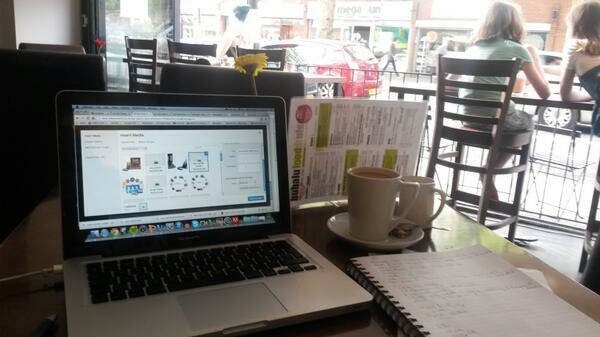 Are you a remote worker yourself? Or do you work in an organisation who allows this freedom? Or just a strong advocate for the practice?